Is Bill O'Brien heading back to the NFL? Have the Houston Texans found their man? 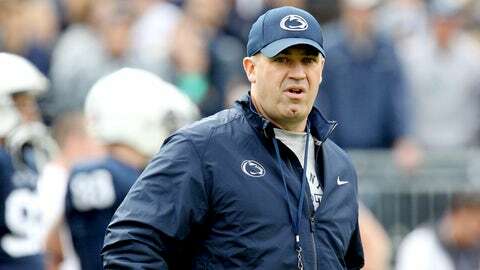 An ESPN report says that the team is working on an agreement with Penn State’s Bill O’Brien for Houston’s vacant head-coaching job. In fact, Chris Mortensen and Adam Schefter say that O’Brien is the "overwhelming favorite" to get the job. The Texans reportedly met with O’Brien at the latter’s home in Cape Cod, after which talks grew stronger in the attempt to finalize a deal within the next week, according to a source. However, one of the Nittany Lions’ top recruits, Thomas Holley of Abraham Lincoln HS in Brooklyn, NY, says he called O’Brien shortly after 6 p.m. ET Saturday after he heard the report. "He said, ‘You’re gonna hear a lot of those things from other schools, saying I’m going to other teams. I’m not. I’m staying here,’ " Holley told Scout.com’s Brian Dohn. Bob McNair on being close to hiring Bill O'Brien: "The process continues. We have other interviews scheduled next week. It isn't over." The Texans had also met with former Chicago Bears head coach Lovie Smith about the job last week. However, he also has considerable NFL experience. O’Brien worked his way up to offensive coordinator during his six seasons with the New England Patriots from 2007-12.